and the Guided Visit to the Botanic Gardens on Saturday 7th June. 2. 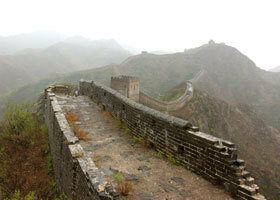 January Talk: Aisling Donoghue on the Simon Community Great Wall Walk. Dublin Simon Community is a voluntary organisation working with people who are homeless. Our first project was a soup run, set up in 1969. 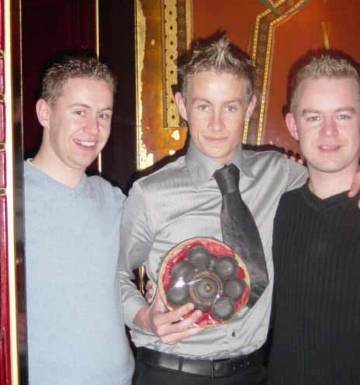 In December of the same year Dublin Simon opened its first emergency shelter. Today Dublin Simon runs an <outreach> service covering much of the city, an < emergency shelter> for 30 people each night, two <supported housing> projects with plans for more, < transition accommodation> for 20 people and a settlement and training project. Dublin Simon also provides a <campaigning> voice for homeless persons, with a commitment to social change. 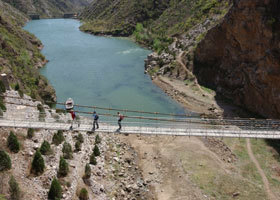 The projects are operated by full-time and part-time volunteers, community employment workers and staff members. Dublin Simon's 5th international hike took place from the 20th -28th April 2002 and our group of 67 hikers explored China on a unique and groundbreaking adventure. This hike took us past restored areas of the Great Wall and onto sections only seen by a handful of people over the last century. We were among the first people to tread areas of the Wall, which nestle in the most remote and stunning hills and valleys in China. 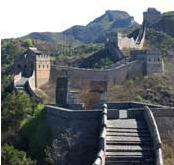 This talk by Aisling Donoghue brought the whole experience, and the magnificence of the Great Wall, vividly to life for her audience. Miriam Donohoe, now Deputy News Editor, gave a packed audience an inside look at her life and work while Asia Correspondent for the Irish Times. This was an assignment that lasted 18 months, during which she was based in Beijing. Even now she would consider giving up her promotion to return to China, she found her time there so fascinating. Her opening remark on the night was that she would talk for about half an hour. Her own timing was perfect, but an hour and a half later she was still talking - I don't think she had expected the amount of questions which would follow. She was asked about life as a journalist in China; how did she chase a good story? What was life like as a westerner living in the controlled environment of the diplomatic area? How did her children settle? What did she think of the food? How did her husband adjust to the new life? 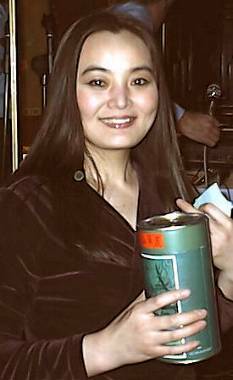 Did she drink and socialise in the Irish pubs in Beijing? How did she cope with the language and her translators? The questions went on and on, some even generating debates among the audience. A great night and a great speaker: our thanks to Miriam for an experience of absorbing interest. 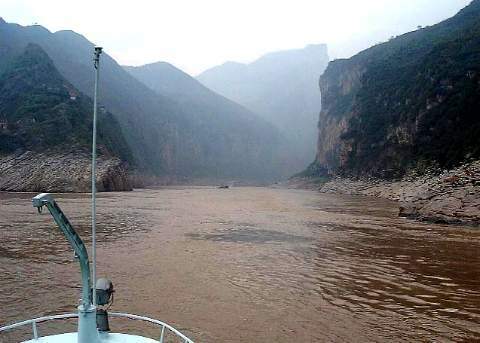 On the 12th March ICCS members had the great pleasure of hearing about the Botanic Garden's expedition to China - more specifically, to one of the Yangtse Gorges which will soon be flooded as part of the great Dam project. 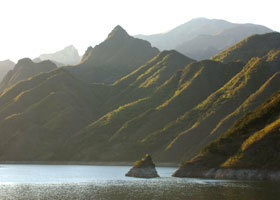 (The Dam will provide downstream protective control, and hydro-electricity to meet much of China's power needs). This flooding will eliminate a number of rare plants currently found in this area. Seeds were collected and plants pressed for the herbariums of Botanical Gardens in Dublin, Kew gardens London and the Botanical Gardens in Wuhan, China. This expedition followed in the footsteps of the noted 19th century Irish botanist Augustine Henry; the journey was recorded by RTE television and will air sometime this year. Seamus, with his infectious enthusiasm, gave us a talk that had everything: science, beauty, and more than a touch of adventure. The beauty was supplied by his wonderful slides, with many exquisite ones of botanical specimens. After a thoroughly enjoyable night, he left us further in his debt by offering to show us the nearly-completed �Chinese Slope� at the Botanical Gardens, as well as the �Chinese Handkerchief Tree� and the Gingko Biloba (a prehistoric tree and a real survivor: insects won�t eat it, and it even survived the bombing of Hiroshima in the Second World War). This walking tour will take place in late May or early June. Jane Almqvist (Tel: 4977206) will confirm the exact date of the visit to the garden, to coincide with the best possible presentation of the plants. 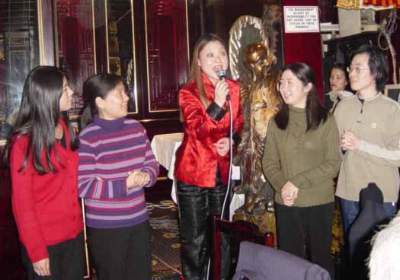 The Irish-Chinese Cultural Society celebrated the Chinese New Year with a dinner at Wong's Chinese Restaurant, Ranelagh, Dublin 6. Over 100 members and guests had a wonderful evening, with plenty of good food, good craic and some excellent entertainment. This was a very successful night, and many thanks are due for a lot of the behind-the-scenes work carried out by your Committee to ensure that all went well on the night. Guests of Honour were the Chinese Ambassador, His Excellency Sha Halin; Mr Howard Pau, representing the Irish Chinese Society; Dr Chris Horn, Chairman of the Ireland China Association; and Dr Katherine Chan Mullen, President of The Irish Chinese Information Centre. We were also delighted to have with us Mr John Gibson, Secretary of the Irish GO Association, and our two distinguished Ambassadors of Friendship, Mr Justice Dermot Kinlen and Dr John deCourcy Ireland. The food was excellent and abundant, the dinner speeches were short and to the point, and short in number too, which left much more time for all the fun stuff. Plenty of volunteers braved the embarrassment and sang into the night. The surprise Grand Finale was a traditional Lion Dance; the creature pranced fiercely to a noisy accompaniment, but seemed to have a partiality for cabbage leaves from the floor. We are especially grateful to Mr Raymond Wong and his staff for all that was done to make the occasion so very successful. Just a note to say thanks to everyone who came and made a great night of last Saturday. It was our third year celebrating the Chinese New Year since the formation of the ICCG and the second year celebrating it at The Great Southern Hotel, Cork Airport. There were 170 who attended the event including 60 children, 45 of whom were adopted. when one travels to China to collect their child. Also the ICCG hosted a new parents forum on issues that arise once you return home. There were the annual celebrations of the Summer Picnic and Moon Festival as well. Then Deputy Lord Mayor, Sean Martin then gave a very well received speech describing among other things what an important role that the ICCG plays in forging links with China and developing a more tolerant society. The meal was then served and was scrumptious! Also talks on Tai Chi and possibly Speech/Linguistics Therapy are likely future events of the ICCG. After the meal Principal social worker at the Southern Health Board, Pat O'Dwyer talked about both Domestic Intercountry adoptions. He said how pleasing it is to see the effect and results of his and his staffs hard work. He also said how important it was to have a group and that there should be more contact with other groups with a similar focus. Then Maretta Brennan (Secretary ICCG) and special guest Xie Qin made a special presentation of Hong Bao to all our children. As was mentioned in the welcome address, this presentation was the focal point of the evenings celebrations. If it were not for our adopted daughters, there would be no celebrations, no group or valued friendships! Chairperson of the ICCG Anne McKernan then gave her speech thanking all the guests, committee members and everyone who had contributed over the past year at all our events. 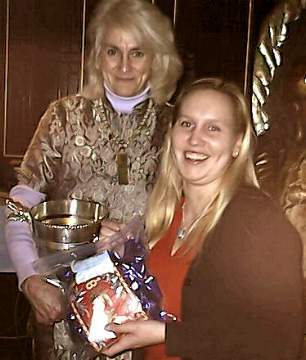 Susan Ryan (Treasurer ICCG) then provided the perfect finish to the events with some novel spot prizes. 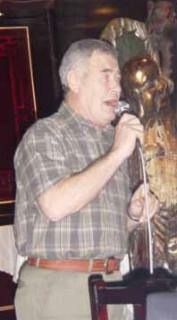 Pat McCarthy provided some music and people sang, dance and talked the night away. Again the event was memorable in that it provided people the chance to catch up with friends they had not had the opportunity to meet in a while. The children had a ball and made good use of the comfy chairs in the foyer and the spacious corridors. Chinese New Year Celebration at Citywest Hotel. 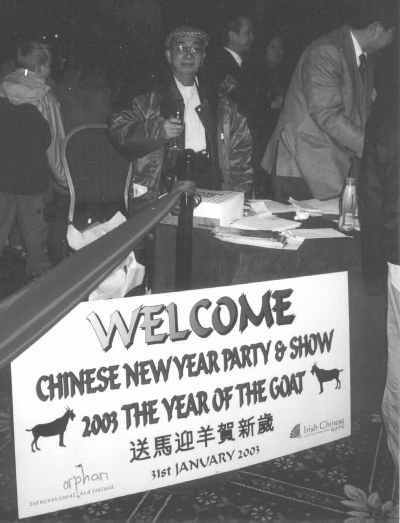 ICCS members will be pleased to know that the newly formed Irish Chinese Information Centre held a very enjoyable Chinese New Year Eve event on 31st January 2003 at the Citywest Hotel. The Centre was formed by past ICCS President Dr. Katherine Chan Mullen to provide information and help to the Chinese Community in Ireland, with particular focus on young students in Ireland for the first time and also helping existing settled Chinese with problems that can arise. Patron of the Centre is past ICCS President Mr Justice Dermot Kinlen who was recently honoured with the highest award from Youxie (The Chinese Peoples Association for Friendship with Foreign Countries) as Friendship Ambassador, a very rarely given award. 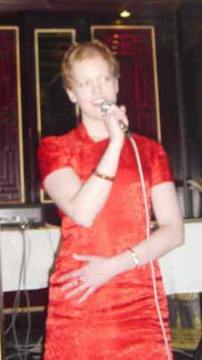 The Chinese New Year Celebration was co-hosted by International Orphan Aid Ireland. This organisation is responsible for much needed assistance in improving the standards and conditions in Chinese Orphanages, helping in medical procedures for orphaned children fostered into Ireland and assisting couples in Chinese Adoption procedure. About 500 guests attended the night, which included two Ministers of State Mr Brian Lenihan T.D. Department of Health and Children with special responsibility for Children's affairs and Mr Tom Kitt T.D. Department of Foreign Affairs. Other groups represented, members of the Irish-Chinese Cultural Society, Irish Chinese Society (The Chinese Business Community), The Irish Vietnamese Association, The Ireland China Association (Irish people doing business in China), Members of the Garda International Unit and The Health & Safety Authority. The Chinese Ambassador to Ireland His Excellency Mr Sha Hailin and members of the Chinese Embassy attended and the Ambassador gave the highlight speech. A wonderful nights entertainment was provided, young Irish and Chinese adopted children first flooded the stage with a fusion of Irish and Chinese acts. An Irish dance group provided the guests with a Riverdance extravaganza. A young Chinese Lady charmed the audience with music on a "Zhang" - a traditional Chinese instrument; young Chinese Language Students gave a marvellous Tai-Chi demonstration. 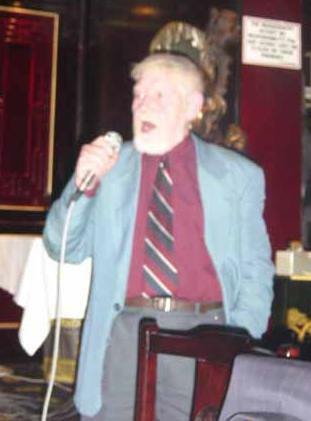 Some lovely vocals of Irish and Chinese Songs were rendered including a song from Ambassador Sha, Tom Kitt performed with two quotations to great applause. Highlight of the evening was no doubt a special fashion show of Ethnic costumes of the various minority tribes living in China. Young Chinese students modelled the clothes lent by the Chinese Embassy. A Chinese buffet meal was served to complete the enjoyment of all. 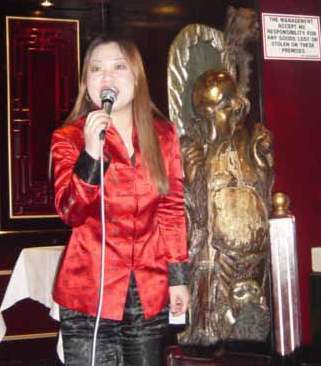 After the formal entertainment, Karaoke singing was enjoyed till late in the evening to welcome in the New Year, The Year of the Ram. 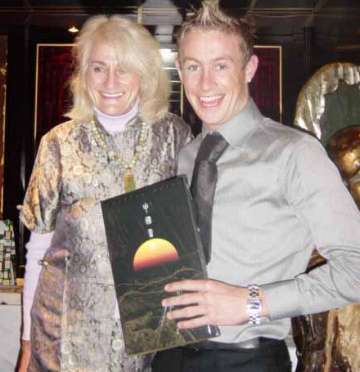 A most successful and enjoyable evening, very professionally organised and managed. Class for Chinese and Food hygiene. Saturday February 8th and the Chester Beatty Library celebrated Chinese New Year with a family day at the Library. The afternoon started with a Dragon dance in the forecourt, the Dragon theme continued indoors with a dragon treasure hunt on paper through the Asian artefacts to see how many dragons could be found. The delightful Mr Wei entertained and educated young and old with a demonstration of Chinese Calligraphy and then gave the children a chance to have a go with brush and ink. 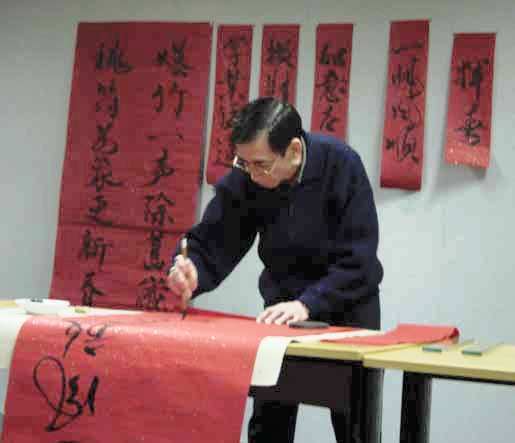 and the making of Spring Festival poems to welcome in the New Year. I went to the CBL shop, which I can never resist, full marks to the buyers for their choice of lovely things to buy. I started with a book of Chinese Art (The Art and Architecture of China by Sickman and Soper), not having bought myself a Christmas present I treated myself to a teapot, Yixing Tea Pot, an item I recently discovered and coveted the minute I saw one. These tiny pots of brown to purple/brown-fired clay are more robust than one would think. The CBL shop still have a number of the Yixing pots in Stock (around 35.00) as well as books, prints, cushions and a CD of the Museum's wonderful Chogonka Scroll ( 10.00) painted in Japan and illustrating an epic Chinese 8th century ill-fated love story. The pupils of Senior Infants, Bayside National School, Dublin, celebrated Chinese New Year. This school has always been open to embrace diversity and the school reputation as an educator has earned them much praise. 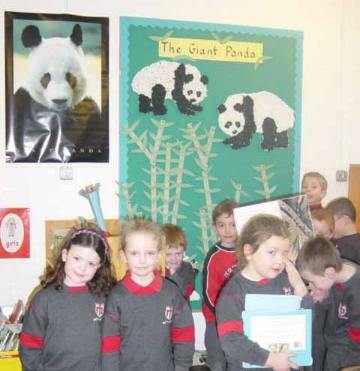 This year as part of their Chinese New Year Celebration the pupils of Senior Infants completed a study of Panda Bears, looking at their habitat, their family unit, their food needs and social behavior. There were many books, posters and stories on display to enrich the pupils' knowledge of these beautiful animals. The pupils got much pleasure in taking part in this study and it was the topic of conversation among the parents, who were informed about Panda Bear lives by their children. The Irish Chamber Orchestra travelled east in March on tour to South Korea and China. This tour, which marks the orchestra's first trip to Korea and second to China, was directed by Mariana Sirbu, Principal Guest Director of the Irish Chamber Orchestra, and featured Korean pianist Hae-Jung Kim as soloist. During its visit east, the orchestra performed in 7 venues kicking off in Seoul on St Patrick's Day, 17 March. The tour was supported by the Cultural Relations Committee, SES Shannon Engine Support and KLM. The Subscription Year for the Society coincides with the Calendar Year, 1st January to 31st December. The Treasurer wishes to remind any members who have not yet paid their subscription for 2003 to do so now. Views expressed by individual contributors do not represent any official policy of the Irish-Chinese Cultural Society.